The geisha world has remained much a mystery throughout history, even to most Japanese people. It is a world that is "shikii ga takai", or difficult to penetrate, with its exclusivity, its seemingly strict conventions, and its prohibitive pricing. 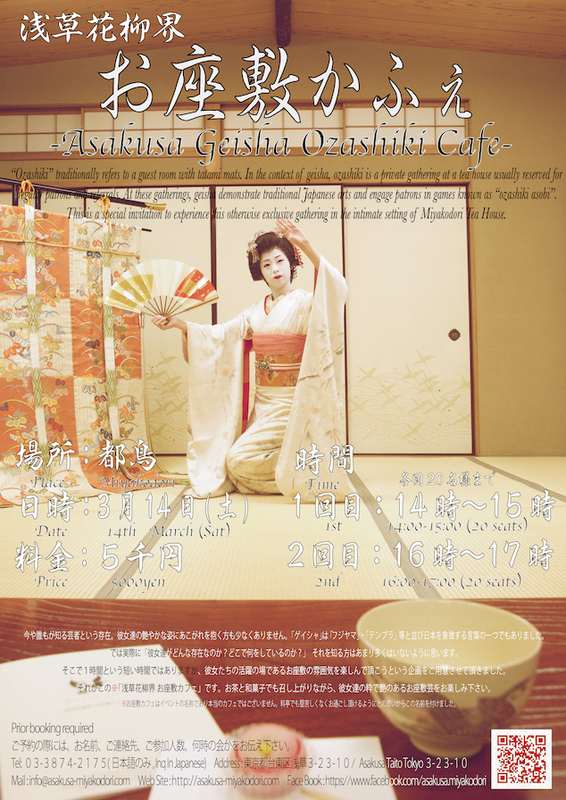 Through this uniquely designed event, "Ozashiki cafe", it is our hope and vision to open the geisha world to everyone and to foster a better understanding of this beautiful art form that has long stood as a symbol of Japan. "Ozashiki" traditionally refers to a guest room with tatami mats. In the context of geisha, "ozashiki" is a private gathering at a tea house usually reserved for regular patrons and referrals. At these gatherings, geisha demonstrate traditional Japanese arts and engage patrons in games known as "ozashiki asobi." This is a special invitation to experience this otherwise exclusive gathering in the intimate setting of Miyakodori Tea House. *Please note that the event will be conducted in Japanese. Nevertheless, we believe the event can be enjoyed by anyone regardless of language ability. *Japanese tea and sweets will be served. and include your name, contact details, and the number of people in your party.